WANT SOME PRAYER SUPPORT? You can post your prayer requests here so an international group of people will be praying with you, for an outcome of the highest good. Don't want or need to read more? Go straight to the submission form. You are not required to register with us in order to post a prayer request; although, your request will not be published until a moderator approves it - this is to avoid spam. Thank you for understanding. We also reserve the right to modify/condense or correct spelling regarding your request, if we feel it is necessary. Prayer Requests are sent to our International Prayer Team once they are modified (if necessary) and then they are published on the site. PLEASE NOTE: When filling in your name, take into consideration that these requests will be made public (unless you specify "PERSONAL" in your Prayer Request then your post will not be made public but will be sent to our International Babaji.net Prayer Team). You may enter a first name or first and last name - or just "anonymous" should you prefer. Do you want to be part of the International Prayer Team and pray for the ills others? Be a Beacon Of Light, become a part of making a difference in the lives of other sentient beings. You will receive an email whenever a new with the requested prayer when we receive them. YOUR INTENTION/REQUEST PLACED ON THE TEMPLE ALTAR WITH A CANDLE: Our donations section also has the option to request a Candle (6-day votive) on the altar with prayer, and other options. 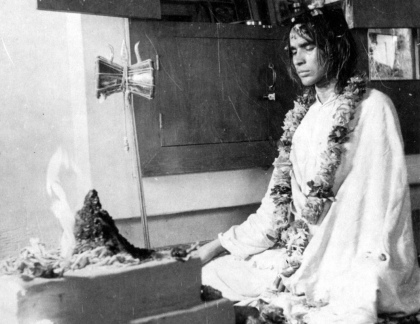 Our website is meant to create spiritual community in support of the teachings and to give guidelines in how to put these principles into action in the way that Shri Babaji has taught us. Your prayer request has been transmitted and will be moderated before sending to our prayer team.